Protactinium crystal, prepared by the van Arkel (chemical vapour transport) process. (Photo courtesy of the Actinide Group, Institute for Transuranium Elements, Karlsruhe, Germany). The name "protactinium" comes from adding the Greek protos meaning first, before the word "actinium." In 1871, Dmitri Mendeleev predicted the existence of an element between thorium and uranium. In 1900, William Crookes isolated protactinium from uraniu. It was an intensely radioactive material, however, he could not characterize it as a new chemical element and thus named it uranium-X. In 1913 the first isotope of element 91, 234Pa, was discovered by K. Fajans and O.H. Gohring. It was a very short-lived member of the naturally occurring 238U decay series and as such they named it "brevium." In 1917/18, two groups of scientists, Otto Hahn and Lise Meitner of Germany and Frederick Soddy and John Cranston of Great Britain, independently discovered another isotope of protactinium, 231Pa having much longer half-life of about 32,000 years. The name was changed to proto-actinium as being more consistent with the longer-lived characteristics of the most abundant isotope. In 1927, Grosse prepared 2 mg of a white powder, which was shown to be Pa2O5. In 1934 he isolated the element from 0.1 g of pure Pa2O5 by two methods, one of which was by converting the oxide to an iodide and "cracking" it in a high vacuum by an electrically heated filament by the reaction: 2PaI5 --> 2Pa + 5I2. In 1949, the name protoactinium was shortened by the IUPAC who officially named it protactinium and confirmed Hahn and Meitner as co-discoverers. The new name meant "parent of actinium" and reflected the fact that actinium is a decay product of the radioactive decay of protactinium. Twenty-nine radioisotopes of protactinium have been discovered. Nearly all naturally occurring protactinium is 231Pa with a half-life of 32,700 years. It is an alpha emitter and is formed by the decay of uranium-235, whereas the beta radiating protactinium-234 with a half-life of 6.74 hours is produced as a result of uranium-238 decay. Nearly all uranium-238 (99.8%) decays first to the 234mPa isomer and then to 234Pa. Smaller trace amounts of the short-lived nuclear isomer protactinium-234m occur in the decay chain of uranium-238. Protactinium-233 results from the decay of thorium-233 as part of the chain of events used to produce uranium-233 by neutron irradiation of thorium-232. 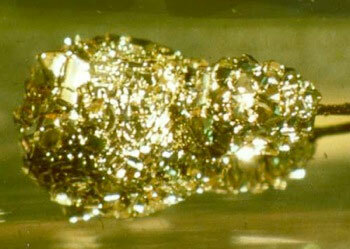 Protactinium is one of the rarest and most expensive naturally occurring elements. The average concentrations of protactinium in the Earth's crust is typically on the order of a few parts per trillion, but may reach up to a few parts per million in some uraninite ore deposits. The element occurs in pitchblende to the extent of about 1 part 231Pa to 10 million parts of ore. Ores from Zaire have about 3 ppm. In 1959 and 1961, it was announced that the Great Britain Atomic Energy Authority extracted by a 12-stage process 125 g of 99.9% protactinium, the world's only stock of the metal for many years following. The extraction was made from 60 tons of waste material at a cost of about $500,000. Protactinium metal is a dense, silvery-gray material with a bright metallic luster which it retains for some time in air but it does readily react with oxygen, water vapor and inorganic acids to form various compounds. In solid compounds protactinium is most stable in the oxidation state +5, but it also exists in the +4, +3 and +2 oxidation states. In solution the +5 state rapidly hydrolyzes by combining with hydroxide ions to form soluble or insoluble hydroxy-oxide solids which have a tendency to stick to the surfaces of vessels in which it is contained. A number of protactinium compounds are known, some of which are colored. The element is superconductive below 1.4K. Because of its scarcity, high radioactivity and high toxicity, there are currently no practical uses for protactinium other than that of basic scientific research, and for this purpose, protactinium is generally extracted from spent nuclear fuel. The element is a dangerous highly radioactive alpha emitter (5.0 MeV) and requires precautions similar to those used when handling plutonium. The element is a radiological hazard similar to polonium. Boris F. Myasoedov, H. W. Kirby, and Ivan G. Tananaev (2006) Protactinium, Chapter 4 in The Chemistry of the Actinide and Transactinide Elements, Third Edition, L. R. Morss, J. Fuger, and N. M. Edelstein, Eds., Springer Publishers. Updated July 2013 by Dr. David Hobart.